DREAM HOME - OVER 2,000 SQ. FT. YOUR LUXURIOUS DREAM HOME AWAITS! 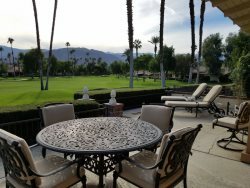 In the 18 years I have worked with vacation rentals at Rancho Las Palmas Country Club, I have yet to see a property as beautifully remodeled and appointed as this spectacular vacation home. With over 2,000 sq. ft. of living area, and all the amenities you could dream up, this property is perfect for either a family or friends get-away! Boasting three newly furnished bedroom suites with private baths, and each furnished with king beds, luxurious bedding and large flat-screen TVs. There is also a bonus room with two extra-long trundle beds … however we must stick strictly to the maximum of six guests in this vacation home. The bonus room is dressed perfectly for children and with a large mounted TV, is a great spot for the kids while the adults watch TV in the great room. The master bath suite features an oversized soaking tub, walk-in shower, his and hers sink and seated vanity. You’ll also love stepping out of the shower onto a heated floor! The entire floor plan of this desirable 3,000 plan, has been altered, and the owners have created one bright, spacious great room. The living area has been furnished with a large sectional sofa and features a “fire and ice” fireplace with a huge mounted flat screen above the mantel. West facing windows frame a breathtaking fairway and mountain view and brings in lots and lots of sunlight. The kitchen is a chef’s dream! The gorgeous custom cabinets are filled with lovely dining and cooking ware … everything you’ll need for entertaining friends and family, and the new appliances make preparing meals easy and fun. The open floor plan allows the cook to visit, even watch TV, while working in the kitchen. The dining table seats six comfortably and there is seating for four at the kitchen bar. Throw open the sliding glass doors for patio dining and ideal indoor/outdoor living. Throughout, this vacation home has been fitted with state of the art electronics. The great room, all bedrooms and even the back patio, have been furnished with new flat-screen TVs and in wall speakers for listening to radio, Pandora or you can even hook up your personal IPod and enjoy your own music from any room. Each room has on/off and volume controls. Cable TV provides you with plenty of viewing choices as well as Netflix and of course the owners have a Blue Ray DVD player. The ideal guest should have enough electronic and computer savvy not to be daunted by this system, however the owners provide clear and easy instructions for use. This vacation home also offers high speed Wi-Fi and only local phone call access. The extended back patio has also been updated with new tile, built-in gas BBQ, dining area, seating area, flat-screen TV and even an outdoor heater to take the chill off those winter nights that may dip into the 60s! View gorgeous sunsets while enjoying a glass of wine, then stargazing while dining al fresco. With the ceiling fan and awning, guests can enjoy the patio even in warm weather. This lovely vacation home is very close to the pool and spa and is located on a quite side street in Rancho Las Palmas Country Club. No smoking please and no pets. There are two golf carts in the garage that are not available for guests use. There is enough room in the garage for one car and parking for two cars in the driveway. Note: Holidays such as Christmas, New Years, Thanksgiving and Easter rates may be higher. Please inquire. Very nice modern condo. Comfortable condo with plenty of room for our family of 6. What a nice home with state of the art amenities. Great location and just a very comfortable spot to spend a few days. We hope to be back here soon.